The Napa and Sonoma Valleys are at the heart of the Californian wine country, producing wines that are praised by connoisseurs worldwide, from a perfect climate of sunny days and cool nights. The area is a forerunner in the latest grape-growing techniques and wine making, and many individual growers, instead of selling their grapes to the larger wineries, are producing their own excellent boutique wines. The Napa Valley is the more commercial of the two, with more wineries, spas and tourist traffic, and a better selection of restaurants and hotels. The valley also caters for classic wine country activities such as hot air ballooning or biking through the vineyards; the world-renowned wineries also offer informative tours, which provide the ultimate wine-country experience. Sonoma Valley is less pretentious and more beautiful in a rustic way, with smaller family-run cellars and fewer visitors. Although the Napa Valley is the USA's best-known wine region, Sonoma boasts more awards than their snobbish neighbour, producing intensely complex reds. 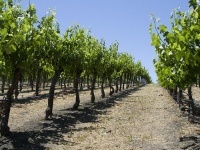 The Napa Valley is a relatively compact region with more than 200 wineries offering tours and tasting. Most of the large wineries with their orderly rows of vineyards are situated along the main thoroughfare that stretches from San Francisco Bay to Calistoga in the north. But there is more to the valley than wine tasting. The small resort town of Calistoga is famous for its mineral springs and mud baths, as well as the Old Faithful Geyser that shoots boiling water and steam 60 feet (18m) into the air every 40 minutes. Nearby is a Petrified Forest with redwoods, seashells and marine life that were turned to stone after volcanic ash from the eruption of Mount St Helena covered the area.